These Walk-In Freezers are the perfect ultra low temp walk-in freezer solution when the utmost storage capacity is required. These freezers bring you flexibility, efficiency and security in a heavy-duty, maximum capacity system all designed to protect your samples, giving you peace of mind. 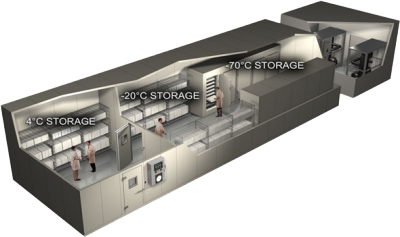 They feature a unique shared central cascade system bringing temperatures as low as -75°C, an extremely large, well constructed cabinet with a capacity of 80 cubic feet to over 1,000 cubic feet and super insulated walls with side doors designed for minimal temperature disturbance providing product protection. 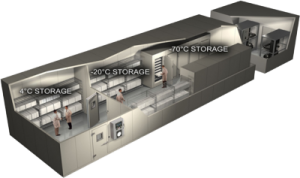 With a number of options available including chamber within a chamber design, our specialists work with you to design a Low-Temp Walk-In Freezer tailored to meet your needs. A grey enamel or optional NEMA 4X stainless steel enclosure contains all branch power, switching and control circuits. 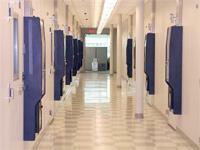 This panel serves multiple freezers from a single central control location. 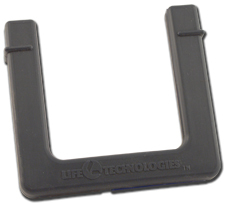 The front features a heavy-duty insert section with Lexan door and key lock. The controls, recorder (if purchased) and non-fade labeling can withstand light spray down. The panel is third party listed to UL standards. NEC code is strictly followed for internal and external panel wiring. Temperature is controlled by a high accuracy, digital PID controller. This type of controller allows for close temperature control through proportional-integral-derivative algorithms (not on-off control). Alarm settings, solenoid actions, system auto-switching, mechanical enabling and other various parameters are controlled through the proprietary CCS touch-screen control system. Alarms are indicated by LCD screen and other highly visible panel-mounted indicators; audible alarms are also standard. Dry contact outputs are standard for temperature alarm limits and may be provided, by request, for other indications. 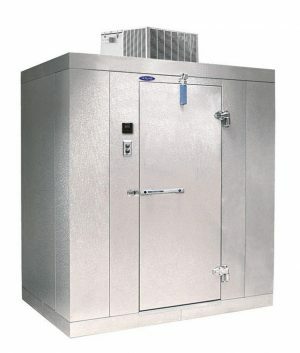 Mechanical refrigeration ‘skids’ serves multiple freezer vaults inside walk-ins or multiple upright reach-in / chest style freezers. Refrigeration skids are designed to be compact, yet offer generous service spacing. Strategic thermocouple locations (and display panel) allow for temperature readings important for servicing. Copeland scroll compressors offers a multitude of advantages over reciprocating compressors: lower energy usage (high COP), fewer moving parts, fewer wear and stress points, lower noise, lower vibration, physically smaller and higher coefficients of performance. The scroll systems use non-CFC refrigerants. Super-high efficiency oil separators remove 99.9% of circulating oil; oil removal is essential for trouble-free compressor operation. Thermostatic expansion valves allow precise metering of refrigerant. Dual, identical mechanical systems alternate regularly for even wear and automatically switch systems based on detected system fault. Product protection is essentially guaranteed with redundancy.